Wonderful property. Well kept and clean. Everything is amazing. Only complaint is hard beds. Pool and hot tub were great. Fantastic experience. Very nice hotel. I would recommend staying here either for business or with family. I did stay on the 2nd floor and was able to experience the view & breakfast which was complimentary. They provided a excellent customer service. Indoor pool is very nice. Due to the season, the hot tub was not open, but it looked very nice. All of the staff I encountered were fantastic. Where to find St. Joseph hotels near an airport? Where can I find hotels in St. Joseph that are near tourist attractions? For those keen to vacation in St. Joseph, book your room as early as you can, because there's not a lot of lodging options in close proximity to St. Joseph's downtown. The Country Inn & Suites By Carlson, St. Cloud East, MN, Minnesota, which is the closest accommodation, sits 16 kilometres (10 miles) from downtown St. Joseph. Another alternative is the Homewood Suites by Hilton St. Cloud, situated in Minnesota, 12 kilometres (7 miles) from downtown St. Joseph. 15 kilometres (9 miles) away from downtown St. Joseph, is the Courtyard St. Cloud. 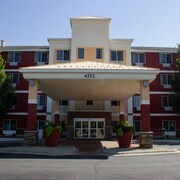 The Hampton Inn and Suites St. Cloud can be found 12 kilometres (7 miles) away. Two other alternatives in this area include the Fairfield Inn & Suites St. Cloud and the Holiday Inn Hotel & Suites - St. Cloud. For those who are keen to see more of the forests and lakes common in this part of the world, you could also spend a few days in other places in Central Minnesota. No matter if you enjoy popular activities, such as cross-country skiing and snowmobiling, or simply tour around to explore the attractions, you will be able to find suitable accommodation in the region. 10 kilometres (6 miles) to the southeast of St. Joseph is St Cloud, where visitors can enjoy the Quarry Park and Nature Preserve. 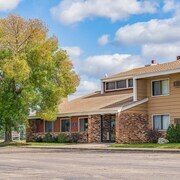 Travelers staying in Waite Park have some great Expedia-listed options to choose from; the AmericInn Lodge & Suites Sartell and Country Inn & Suites By Carlson Saint Cloud. While exploring the St. Cloud region, why not visit St Cloud, home to the Paramount Theater. St Cloud is situated 17 kilometres (11 miles) to the southeast of St. Joseph. 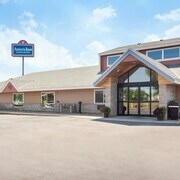 The AmericInn Lodge & Suites St. Cloud and Holiday Inn Express Hotel & Suites St. Cloud are great places to lay your head. If you are into sports and enjoy watching local games you might like to make a trip to National Sports Center, which is 100 kilometres (62 miles) to the southeast of St. Joseph. Those sports fans wanting to find a bed close to the action can take their choice from the Country Inn & Suites By Carlson, Shoreview, MN or the Best Western Plus Blaine at the National Sports Center. St. Joseph features some terrific attractions for visitors and locals alike; learn more by visiting Expedia's informative St. Joseph travel guide. What are the most popular St. Joseph hotels? Are there hotels in other cities near St. Joseph? 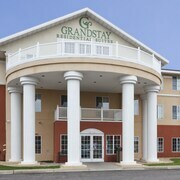 What other types of accommodations are available in St. Joseph? Explore St. Joseph with Expedia.ca’s Travel Guides to find the best flights, cars, holiday packages and more!